Now that we’re 50 days into the NBA season, it’s time to hand out the awards for the best performers over the first quarter. But will today’s winners still be the favourites when the official votes are counted? Despite the Jazz falling terribly short of expectations so far, Rudy Gobert is still the $3.40 favourite for the Defensive Player of the Year award. Utah’s team defence isn’t at it’s best, but Gobert still leads the team in defensive box plus-minus. He’s fourth in the NBA in defensive win shares with 1.5 while sitting six in blocks with 2.1 per game. Overall, Gobert is still the heart and soul of the Utah defence and is one of the few players that can turn a game on its head on that end of the floor. Kawhi Leonard is doing his most noticeable damage through the 26.1 points he’s scoring per game. However, he’s also doing enough defensively to be on the second line of betting at $4.50. It’s Anthony Davis that should be looked at as the roughie at $5, though. The Pelicans are poor defensively. As a team, their defensive rating ranks 24th at 112.9. With Davis on the floor, they shoot up inside the top ten with a 107.3 defensive rating. Even while averaging 2.7 blocks per game (2nd in the NBA), it could be argued that Davis hasn’t been trying particularly hard defensively. He’s forced to put in so much energy on the offensive end, he’s looked somewhat lethargic in defence. If Brow can reignite his effort defensively, his current $5 price will take a sharp dive. There are a lot of retracted comments and deleted tweets 50 days into the NBA season. Those that doubted Luka Doncic could transition from the Euroleague to the NBA have been proven unequivocally wrong. He’s close to an unassailable favourite for Rookie of the Year at $1.24. 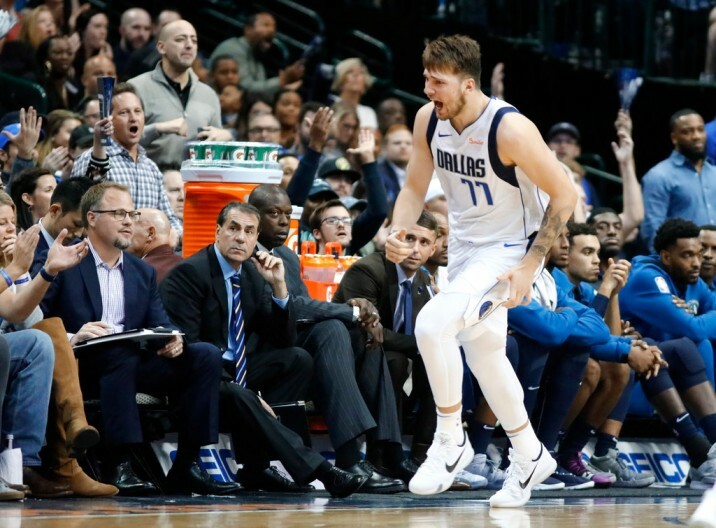 In just 21 games, Doncic has made the Mavericks his team. He’s 19-years old but looks like a veteran. His step-back isn’t only NBA-ready, it’s one of the best in the league already. A decent scorer, incredible passer and reliable performer overall, only an injury will stop Doncic from winning the Rookie of the Year award. Should he fall over, our traders have Deandre Ayton on the second line of betting at $4. The beneficiary of being on a truly awful team, Ayton isn’t short of opportunities. He’s averaging an impressive 16 points per game on 60% shooting while pulling down 10.2 rebounds. However, with so many issues defensively, in pick and roll situations, in particular, there’s a strong argument for him not to win it. Jaren Jackson Jr, on the other hand, is only adding to his ROY credentials. He’s at $11 to win it now, but that number won’t hold. As his role in this Grizzlies team grows, Jackson continues to rise to the challenge. His 36-point performance against the Nets might be the most impressive of any rookie so far this season. With his 13.9 points, 4.5 rebounds, and two blocks per game set to increase, Jackson is capable of closing the gap on Doncic. Following a hot start to the season, Giannis Antetokounmpo is $3.30 favourite to win his first NBA MVP award. Despite shooting an abysmal 11.5% from beyond the arc, the Greek Freak still scores 27.6 points per game. Given his size and speed, Antetokounmpo is getting to the rim at will and shooting 77.2% in the restricted area. If he finds a three-point shot, look out. The Bucks are already the 2nd seed in the East on the back of Antetokounmpo’s 27.6 points, 13.2 rebounds, six assists, 1.5 steals and 1.3 blocks per game. He will be tough to unseat as the favourite if they remain that high in the standings. Our traders have LeBron James ($5) and Anthony Davis ($6) on the second and third line of betting, but it’s Steph Curry at $6.75 that deserves the most attention. He’s only just returned from a groin injury, but Curry is lighting it up and making a strong case for the MVP. With 42 points against the Hawks, Curry is averaging 30.2 points per game while putting up some outrageous shooting numbers. We talk about players shooting 50/40/90. Right now, Curry is shooting 51.9% from the field, 50.3% from three, and 93.1% at the line. With numbers like that, voters won’t be able to ignore Curry provided he stays healthy. He’s the best bet at $6.75.